I love sheet cakes. They’re easy to make, they’re tasty, and they feed a crowd! The latter is basically the reason I made this pumpkin sheet cake for the chili cook-off at work on Halloween. We had a lot of people participating in the cook-off and I wanted to make sure there was enough cake for everyone to try a piece. And who doesn’t like cream cheese frosting? This cake was really good. I was worried it was going to be dry without any dairy products in the batter, but it turned out moist and delicious. 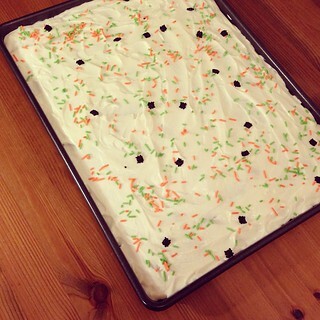 Plus the colorful Halloween sprinkles, including little black sugar spiders, looked great on the white frosting. I’d like to try this cake again, but with either a white glaze (from the awesome white sheet cake I made next year) or chocolate glaze (from the perfect chocolate sheet cake). This is the perfect fall cake so make it while you can! In a large bowl, stir together the eggs and sugar. Add the oil and pumpkin puree and stir until combined. Add the cinnamon, nutmeg, cloves, cardamom, baking powder, and baking soda and stir until combined. Add the flour and stir until just combined, scraping down the sides of the bowl with a spatula as necessary. Do not over mix. Spread the batter into a well-greased jelly roll pan (mine is 15x11x1″) and bake at 350 deg F for about 25-30 minutes, or until a toothpick inserted in the center comes out clean. Place the pan on a wire rack and cool completely before frosting. For the frosting, with an electric mixer beat the butter, cream cheese, and vanilla until smooth. Gradually add the powdered sugar and beat until combined. Spread the frosting on the cake when it is completely cooled (I didn’t use all of the frosting because I wanted a fairly thin layer). I added some Halloween sprinkles at this point for show. If you’re not planning to serve the cake immediately, store it in the refrigerator to preserve the cream cheese frosting. Take it out of the fridge about 30 minutes before serving to let it warm up to room temperature. Enjoy! Based on Nancy Creative’s Pumpkin Sheet Cake.